Remember my Italian sweet basil plant that I told you weeks ago? Thanks to my nurturing hands, it’s blooming, growing, and abundant with leaves. Sometimes, I just pluck the leaves and straight away they go into my mouth. They are a quick pick-me-up and great as a palate-cleanser especially after some spice-laden Malaysian food. But the highlight has to be my newly “invented” recipe that makes good use of them–complete with my favorite clams!–capellini with cockle clams and lemon butter sauce. I got the inspiration when I went to a cafe with my co-workers a few weeks ago. The capellini dish that I had was topped with shrimp and spinach in butter sauce. Capellini with Cockle Clams and Lemon Butter Sauce - bursting with flavor -- the freshness of diced roma tomatoes and sweet basil leaves, all happily married in a light lemon butter sauce. Bring water to boil in a pot. Cook the capellini according to the instructions on the package. While boiling the capellini, heat up a saute pan and add in the butter. As soon as the butter melts, saute the garlic until you start smelling the garlicky aroma (but before they turn brown). Add in the diced roma tomatoes and saute for 1 minute. Toss in the cockle clams and cover the saute pan and wait for the clams to open. Once all clams are open, add lemon juice, salt to the sauce, and toss in the sweet basil leaves (but leave some for garnishing). Drain the capellini and transfer to serving plates. Top the capellini with the cockle clams and lemon butter sauce. Sprinkle dried parsley flakes generously and add the sweet basil leaves before serving. beauteeeeful!! I love clams and I almost bought some today, which your post would have been so perfect for. oooooh! yummy. I love clams too. The last time I had them was last summer in Tuscany. I need to find some now so I can cook um. 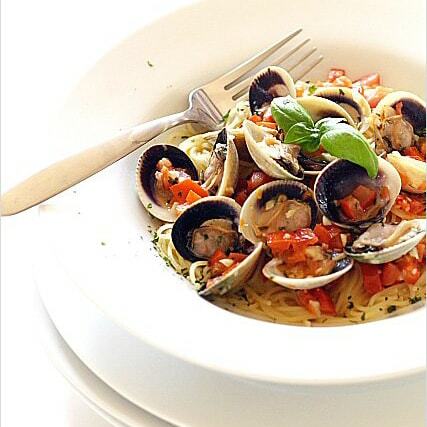 Can’t wait for the recipe for the clam pasta….I’m hungry already….hurry! But I’ll satisfy my pasta/seafood craving tomorrow with your angfelhair recipe. that looks fantastic. Thanks for sharing and love the way your photos come up. great job! Will be some time before I post. yr food picture alwiz so beautiful!! Dunno when can i be expert as u..
mmmm! this is one of my alltime favorite dishes. beautiful! beautiful! I love all your recipes…although I am a vegetarian…Nice blogs! Yum! The pics look nice. I wonder if I could just use canned clams instead. Saju – wow, I can’t imagine not having clams for such a long time…I love clams and have it very often. Claude – I actually like sweet basil leaves now…they are so elegant. Malaysians we don’t use Thai basil in our cooking. Princess – this is not our kerang even though it’s called cockle clams…they are like manila clams actually. I got them from 99 Ranch. Our kerang you can get them from Little Saigon, but only seasonal I think. Anh – yes, I love my basil plant…very handy. Jackson – it’s just about the camera you use, really, no secret. You’re doing a fantastic job with your point-and-shoot. Meiyen – this is not our see hum…it’s cockle clams, which is another kind of clams, not our bloody kerang. LOL. Yes…yummy it was. Joey – exactly, shellfish and seafood are most welcome on my plates, anytime! Oh I will try it alright! It sounds amazing, especially with all that butter and sweet basil. Isn’t it lovely to get to pick your herbs from your garden? I love it! Teckiee – cool…looking forward to see your post. You’re making me crave clams! :D This recipe looks delish! Looks so yummy. Really wish you open up a restaurant, then we will get to try. Mmmmmm lovely! I haven’t had clams for ages! Can’t get them nice and fresh in Frankfurt unfortunately. My hubby dug me some clams this morning and I hate sand when eating them. I was told to put them in salt water with cornmeal and they would clean themselves. I have tried that and they still “crunchy”. How do you get the sand out of them before cooking. I like to steam in butter, garlic and white wine. It is really sad which I not understand English because your receipts must be delicious. I love cockle! Thank you for this capellini with cockle clams and lemon butter sauce recipe. I have a question: When do I add pasta sauce?